In the late 1800s, Saranac Lake, N.Y., with its robust mountain air and preternatural quiet, became a destination for legions of people afflicted with tuberculosis. Dozens of Victorian “cure cottages” sprang up there, their enclosed porches designed to expose sufferers to the fresh air that was thought to be part of the cure. Patients ate three hearty meals a day, but not necessarily foods we associate with recuperation: copious amounts of raw milk, meat and eggs. Fat, people believed, paved the road to recovery. Whether the air or the food was responsible, thousands of people left Saranac Lake in good health, and its reputation as the place to kick TB persisted until the 1950s. Today, however, the classic convalescent diet of whole milk, game and other meat, and fermented vegetables may seem as quaint as the cottages. The Adirondack culinary cure has fallen victim to modern trends in healthy eating, fed by the belief that fat clogs our arteries and regular consumption of meat inclines us toward all kinds of ailments. But one Adirondack chef is bucking those trends and reviving the tradition. Cathy Hohmeyer’s kitchen lies eight miles outside Saranac Lake on the shores of smaller Lake Clear. Here, at the resort she owns with her husband, Ernest — Lake Clear Lodge & Retreat  — she fuses the hearty fare of those cure cottages, the German and Polish dishes she learned from her mother-in-law and the local and foraged foods of the mountains, all with an eye to improving our constitutions. 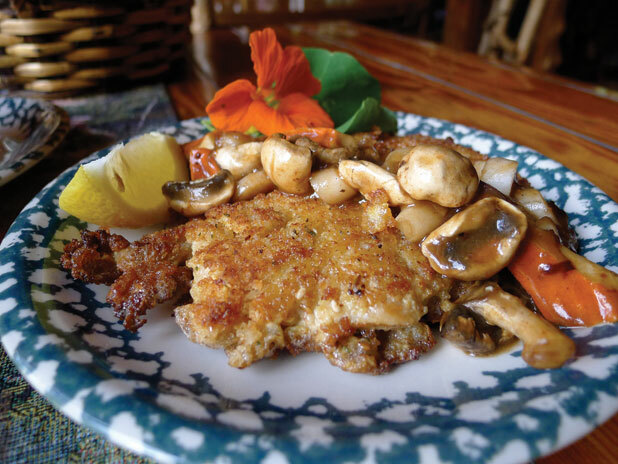 Hohmeyer touts the healing virtues of this “Adirondacks-Alpine fusion” fare, as she calls it, and says it’s her best shot at answering a tricky question: What exactly is Adirondack cuisine? “We’ve taken different traditions and developed our own,” says Hohmeyer, 50, a petite woman with gray-green eyes. The backbone of her menu is local meat, dairy and produce, supplemented by whole foods that are fermented and sometimes raw. Ernest Hohmeyer points out that his wife’s fare uncannily resembles medieval European cuisine, with its bone broths, lots of cultured and whole-milk dairy, roasts, and absolutely no fear of fat. Together, the Hohmeyers run the lodge — with its historic main building and sprinkling of cottages — on 25 acres beside breezy Lake Clear. Cathy’s relationship with the lodge’s kitchen predates her marriage to Ernest: She first got a job there during high school and cooked alongside Omi Hohmeyer, his mother. A Polish native married to a German, Omi taught her young charge the hearty dishes of the couple’s homelands — schnitzels, rösti and rouladen among them. The elder Hohmeyers had purchased the rundown property in 1965; they settled their family of five in the one-room lobby for the months it took to refurbish the place. One of the first people young Ernest met in school was Cathy; she fell from a slide as they were joking and broke her wrist. The two wouldn’t talk again until years later. First, both left the area; Cathy pursued a career as an occupational therapist in Washington, D.C., while Ernest went off to grad school. They returned around the same time, and when Ernest and his parents decided to sell the lodge, in the early 1990s, Cathy showed up looking to lease the place. “I was going to learn to run the resort. I didn’t want to see this place disappear,” she says. After she fell in love with and married Ernest, the couple purchased the inn from his parents in 1994. While researching its history, they discovered that the main lodge had actually been built by Cathy’s family, the Otises, as a post office in 1886. “She had no idea,” says Ernest. Today, the main lodge and its restaurant seem caught in an earlier time, with their wood-beam floors, ceilings and walls; chairs made from birch limbs; woven branches along the ceiling; and table runners, beer steins, plates and bowls decorated with pine trees and various Adirondack scenes. A giant moose head surveys the entrance to the dining room. The subtly kitschy ambiance is deceiving, in a way: Behind it lies the Hohmeyers’ ambitious vision of the lodge, which for decades has hosted the usual vacationing families, couples and outdoor enthusiasts, as a wellness oasis. Some of the cottages have hydrotherapy showers, and the Hohmeyers recently built an airy retreat center to entice health-minded groups and conferences, as well as to hold cooking demos. At the heart of their plan is Cathy Hohmeyer’s kitchen, where she quietly plays with a toolbox of ingredients and techniques to render an “Old World ethnic fusion” with tinges of cure-cottage cooking. Dumplings, for instance, may come made with quinoa and local vegetables. A cucumber salad might be dressed with raw apple cider vinegar; a stroganoff filled with grass-fed and natural meats and game; a pudding infused with a few drops of lavender essential oil. “‘Low fat, no fat’ is kind of making us sick,” says Hohmeyer, explaining the theory behind her culinary practice. Hohmeyer’s interest in healthy cooking and whole foods grew over the years as she helmed the lodge’s kitchen, and eventually she connected with the Weston A. Price Foundation, the D.C.-based nonprofit devoted to spreading the word about “nutrient-dense” foods such as raw milk, raw vinegars and cultured milk products such as kefir. (Hohmeyer is the Adirondack chapter leader.) She also drew inspiration from cookbooks such as Sally Fallon’s Nourishing Traditions, which refutes vegetarianism page by page as it advocates for the powers of animal protein. It was probably only a matter of time before Hohmeyer, who is also pursuing a doctorate in naturopathy, researched the foods that TB patients ate during their convalescence in nearby Saranac Lake. “Once you were diagnosed, the idea was to keep up your weight. They pushed eggs, milk, bone broths,” she says. Hohmeyer leafed through cookbooks of the era, developed recipes, and began holding interpretive dinners and demos of some of her techniques and the philosophy behind them — such as one called “The Forgotten Cure: Cure Cottage Cuisine ” at a recent festival. Those techniques include using essential oils, such as basil oil in a trout dish, or “unbelievably earthy” pepper oil. “It takes super-little,” Hohmeyer says, to affect the taste of a dish. “And it bumps up the vibrational level of the food,” she adds, evoking the naturopathic concept that each food has an energy level that can be measured in megahertz. Hohmeyer carefully controls cooking temperature to preserve the nutrients in the foods she buys from local farms or picks in her garden. When she can, she soaks and sprouts grains to neutralize the acids that can cause allergies; she uses yogurt and sour cream liberally; and she lacto-ferments vegetables, including her own red cabbage. “I never thought I’d use sauerkraut [in the lodge] until I had the real thing,” she says. Her sous-vide cooker “helps preserve the nutrients of the food. It cooks slowly at 140 degrees, and grass-fed beef comes out like butter,” she says. As she shreds potatoes into a bowl for dumplings before a recent dinner, adds egg, flour and nutmeg, and painstakingly rolls them into almost perfect circles, she looks content. “I have a lot of fun,” she says. Near Hohmeyer’s workstation, a pile of foraged orange lobster mushrooms and another of pale, teardrop-shaped roots await her knife. The latter, she says, are the remaining ramps of the season; she may use them in soup, and the mushrooms in a sauce. Ever the partner, Ernest leads guests arriving for dinner into the downstairs rathskeller — the German term for an underground bar — where he runs through the menu and offers drinks. Beyond the room’s couches, pool table and huge fireplace is a wooden bar that Ernest Hohmeyer built from some pines that were felled by lighting. He also used some of that wood to erect a wine cellar and a bierkeller filled with hundreds of mostly European, bottle-fermented beers — Trappist ales, hefeweizens, saisons — and a few local brews. Those who eschew beer can choose from a list of 20 wines by the glass, most of them sustainably made. Each night, Hohmeyer explains the four or five entrée choices — an herb-encrusted Canadian salmon accompanied by sour cream infused with locally distilled vodka, perhaps; or the Adirondack Alps Hasenpfeffer (rabbit stew); a crisp, slow-roasted local duck; a bratwurst; or a pike-filled rösti. In nice weather, after he collects orders, Hohmeyer urges diners to take the three-minute stroll down to Lake Clear, much as they might have done during the heydey of the great camps, when guests moved from building to building during a meal. The Hohmeyers are big on soups and their soothing properties, so each dinner starts with a steaming bowl of whatever’s on. On this night, it’s a barley soup in a rich, brown beef broth with tender chunks of grass-fed beef nestling amid curls of sliced celery and carrots. The salad course follows: a mélange of iceberg lettuce and baby greens from the lodge’s garden dressed in citrus juices and dotted with orange and cranberries, with crushed walnuts dusting the top. The puckery salad feels like a turbo-boost of vitamin C.
The pike rösti is an enormous golden potato pancake crisped at the edges, with hints of cumin and turmeric. Inside, the first forkful of herbed pike is oily and snow white. Smothered in piquant red cabbage and apples, it’s an explosion of complementary flavors — pickles, salt, fat. A jumble of broccoli, green beans and chard sautéed in sesame oil rounds out the plate, garnished with a nasturtium flower. A chicken jägerschnitzel, coated in panko and fried to a dark brown (probably in butter), is luscious and filling. Across its top, Cathy Hohmeyer has spooned slivers of those lobster mushrooms and ramps in an earthy brown sauce. It’s an almost autumnal fusion of European mountain fare, the local landscape and the chef’s mission to cleanse our human carburetors. Fortunately, the coniferous woods along Lake Clear are filled with paths for walking it all off. Here, as in the Alps, a hearty diet and a rugged landscape are natural partners. I want to give a super commendation for the nutrient content, flavor, and delicious FAT in chickens raised at Magic Hill Farm just outside the Adirondack State Park of NY State. I got 2 large stewing birds at the WAPF meeting at Lodge on Lake Clear last month. The broth I made from their old hens was rich, satisfying and absolutely organic including guaranteed NO GMO feed. Truly organic chicken is as scarce as hen’s teeth – you can tell by flavor, the strong, well-formed skeleton and the firmness of the broth once it cools. Lynn, as always, thanks for all your assistance in helping to provide good foods for this area and beyond.